Saturday was closing day at Aqueduct, and by the time that last race is run, most people who have spent the winter in Ozone Park are unashamedly declaring their enthusiasm to get back to Belmont. The grittiness of Aqueduct, the lack of aesthetically pleasing outdoor space, the long weeks of (charitably) mediocre racing have taken their toll, and Belmont beckons with it s promise of spring, verdure, and good horses. If all goes according to plan, Aqueduct, as we know it will, without fanfare, notice, or a proper eulogy, disappear this summer, replaced by the latest incarnation of itself, not for the first time. In the 1950’s, Aqueduct – first opened in 1894 – was completely renovated, a process that garnered hundreds of column inches from the middle of the decade to the grand re-opening in 1959. Aqueduct has been chosen as the locale for this city’s “bright new world” of thoroughbred racing, it was announced yesterday by the Greater New York Association, Inc. The association promotes racing in this state on a non-profit basis, under the supervision of the racing commission. Among the modern features will be escalators, air-conditioned restaurants and easy access to parking areas and public transportation. The new racing oval will be a mile-and-an-eighth strip, with a turf course inside and figure 8 jumping course in the infield. …the amazing thing about the Aqueduct opening [in 1894] was that it rated only three lines in The New York Times…Aqueduct got the brush-off treatment…and the next day was even worse. The NY tracks have long been relics [and] look frayed, woebegone and down-at-the-heels…Desperate situations call for desperate antidotes. Despite all the controversy and debate in the inner councils as to whether Belmont or Aqueduct would become the supertrack, there really wasn’t any alternative. The complete rebuilding of the oval near the Idlewild airport was so logical a solution that the actual announcement must be regarded as not much more than a formality. Then the long-suffering NY horse players will learn how the rest of the world has been living. They’ll be catered to at long last. The horse players won’t get any richer but at least they’ll be able to mosey along to the poorhouse in a luxury and comfort that so far have been denied to them. Blueprints and bulldozers combined yesterday to push Old Belmont Park’s historic landmarks into oblivion in the name of progress. The 175-year-old Manice Mansion where Louis Philippe I, King of France, spent part of his exile is being steel-balled into rubble. The baroque dwelling acquired by Belmont Park in 1904 was the original home of the Turf and Field Club, organized in 1895. Near-by Aqueduct meantime was being prepared for the start of its $25,000,000 rebuilding program next week. By the spring meeting of 1959 the Greater New York Association, which conducts flat-racing meets in this state, expects Aqueduct to be the finest track in the East. At its 1905 opening [Belmont] was hailed as the last word in modern racetracks. Grandstand admission was $2 for men, $1 for women. Grave concern is being expressed in horse-racing circles these days for the serious racetrack fan. He is close on the heels of the vanishing Indian in the race to obscurity, and may even win in a photo finish. The reason: luxury. The racetracker is being pampered and spoiled at every turn, not to mention at the eighth pole and the stretch. Aqueduct is expected to re-open next season in a splendiferous setting. Even the classic elegance of staid Belmont has bowed to the trend with the installation of escalators. So grand were the early descriptions of the project that it acquired the appellation “dream track,” a term used almost universally in any conversational reference to Aqueduct. Several weeks before the announcer at the Aqueduct Race track sounds the familiar “the horses are on the track,” a $500,000 advertising and promotion program will have started. This stands for Aqueduct. It also relates to the nickname for New York City thoroughbred racing, referred to by improvers of the breed as the “Big Apple.” This is meant to signify big-time racing, as opposed to racing in smaller cities. The new Aqueduct is planned for a useful life of 50 years. They certainly got that one right, didn’t they? Another great written, well-researched article, Teresa. Thank You! Alas, the bad weather kept me from going out this past Sat as I had hoped to and maybe it was just as well as Justin Phillip broke my heart, not to mention my NYRA Rewards acct., when he ran out of gas at the 1/16th pole. But that’s a different subject…. I have been conscience that this Winter was going to be the end of the physical plant as we have known it. I arrived in NYC in 1985 and was able to attend the one and only Breeders Cup that was hosted there. I had never seen anything so vast and large before, and I knew I had graduated to the Big Leagues of horseracing once I made my way to the windows. I seem to recall some local TV advertising around that time that made Aqueduct seem so glamorous. I always liked the way it was referred to as, “The City racetrack”. But right, it’s going to be very different next fall. I still find it hard to believe all these “high rollers” will be coming out to Ozone Park to play slots, and those illustrations about how the new Big A will look seem hard to believe. I’m secretly hoping the phrase, “the more things change, the more they stay the same” will apply to the new, new Aqueduct. >> The new Aqueduct is planned for a useful life of 50 years. One well-framed final review, Teresa. Thank you. The bluecollar track that is Aqueduct, the Big A, was truly grand during the first decades of its era, and supremely efficient, even through the (nineteen-)nineties of its maturity. For a simple racing official such as I, there has been no more easily managed a working venue than our former Aqueduct Race Track. What a comparative pleasure it was to do our job within the supremely controllable environment of that track, where, in addition to the occasional Jamaica Bay fog and airport SST flyovers, we more than once got 40,000 for a Presidents Day card! Those were the days, my friend: We thought they’d never end. From the short walking distance between the Jock’s Room and the Paddock; from the quick parking-lot-corridore walk to Leo and our Press Box elevators; from one closely spaced ground-floor business office to another and easy inter-departmental walking; from easy driving access to the Belt Parkway for our commute to Belmont Park or to home; from the quick walk between Barn #1 and the last Receiving Barn or Pony Barn; from the relatively simple proximity to JFK Airport, the Van Wyk Expressway, and to Manhattan for those oh-so important business meetings; for the only NYRA announcer booth with two opening windows, ten steps from the stewards’ stand; our most demanding day-to-day concern for so long was simply the challenge of getting there to perform our duty. Long live the memory of our big city Thoroughbred racetrack, the big easy, the BIG A! 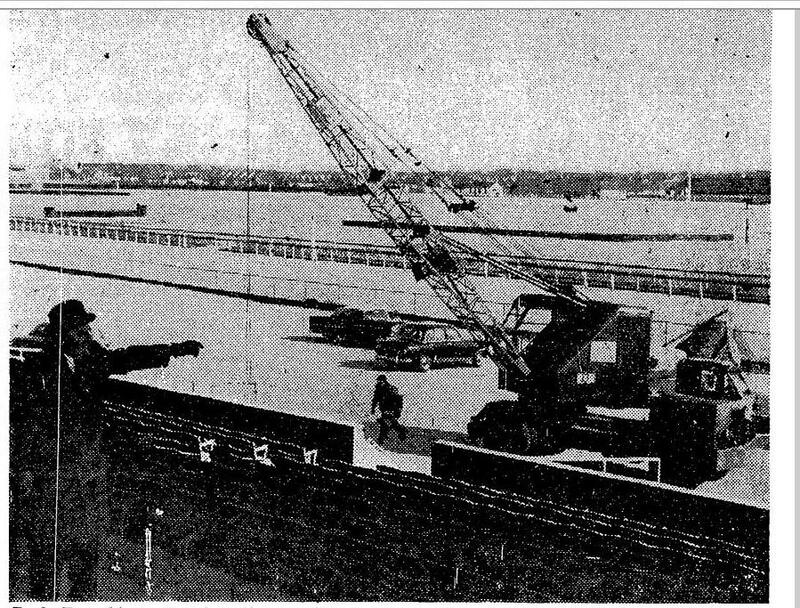 What’s so interesting was all the work being done on Belmont Park at that time, which ironically would only last a few years as the old Belmont building would be condemned at the beginning of 1963 to be re-built, with the new Belmont opening in 1968. I love Aqueduct, Marshall, but it does have this bit of inconvenience: no toteboard visible from the paddock, and if you want to make a wager after seeing the horses down there, it’s quite a haul up to the first floor! Beyond that, hear, hear to your comments! Walt–the Belmont renovation is a whole other story in itself…to come! 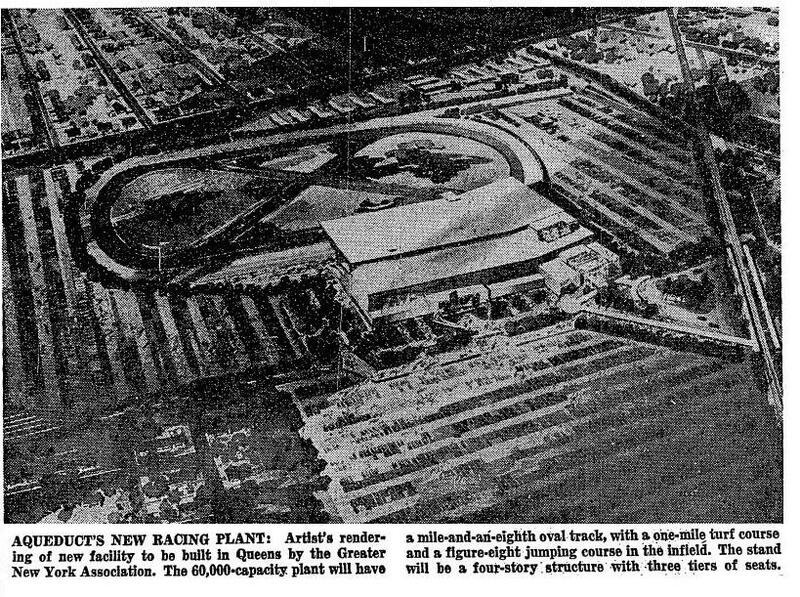 I’m old, but I don’t really remember the construction of the new Big A in the 50’s (parents were definitely not racing fans). I note, however, that the concept of Aqueduct as the “dream track” did live on, at least in the mind of the NYRA marketing department. In the early to mid-70’s the pencils they sold at Aqueduct were blue and inscribed “AQUEDUCT THE DREAM TRACK”. In those days they would draw 30,000 and upwards on Saturdays, even on cold days, and the season would end for a few weeks, usually after the Display Handicap (if memory serves), a marathon race. I’m not in charge but, I often wonder why the Belmont Spring meet didn’t start around the third week in March, and run until the end of June. Saratoga could be the Summer meet, and run from July 1st until Labor Day. The Belmont Fall meet would begin afterwards, and run through the Thanksgiving weekend. Aqueduct would just run a Winter meet from @December 1st through mid-March. Get rid of the treacherous turf course with it’s sharp turns, (and not being maintained as well as Belmont’s and Saratoga’s courses). 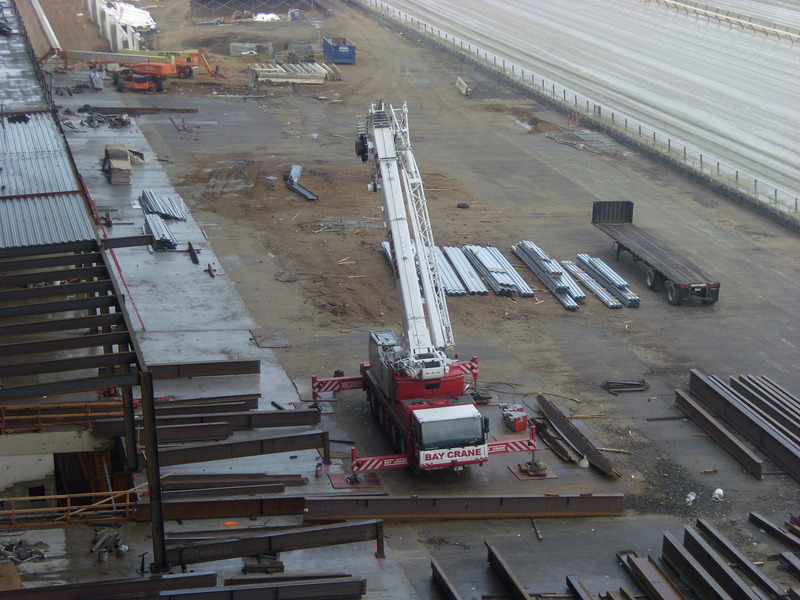 Get rid of the inner track but, winterize the main track and run all of Aqueduct’s Winter races there. It would expand the Saratoga meet slightly, (the most successful meet in the country, in my opinion), and have Belmont start a little earlier. Very nice; thank you. Also, I just finished “The Archjockey of Canterbury,” by Kent Hollingsworth (1986), and it was almost eerie to read his Bloodhorse editorials and stories in which the Big A was in its prime. The book is excellent – and one of the best features offered is the reprint of Marshall Cassidy’s obituary (the M.C. above is probably his son, but I can’t say that for certain). What an amazing life he led! Is that the same one who turned into an advertising giant? We went to see How To Succeed in Business about a month ago. Written in the late 50s-early 60s, there’s a scene in it that satirized advertising at that time, specially, BBDO. It meant nothing at all to the majority of the audience in 2011. Since it was a preview, I wonder if the director cut it out before the formal opening. Sorry about that. Having never placed a wager, I didn’t know about that bit of inconvenience. My grandfather was a foal of 1892 and I of 1945. Never got to work with him, but, yes, he did lead an amazing life on and off the track. It’s strange but I have never been to Aqueduct more this year than the last 20 combined. I have enjoyed it as much as some of the best days at Saratoga. I think the almost decrepit nature of the track and the failings of the otb infrastructure are probably to blame. When I was young I lived in upstate New York. My sister bought tickets to a band called U2 who were playing at a small venue called JB Scotts. She was 15 at the time and you had to be sixteen or older to get into the show so my mother wouldn’t drive her up. She missed it along with the rest of the capital district. When they hit the big time everyone and their brother told you they were there. If all the people had been there that said they were it would have sold out Giants’ Stadium for a month. We go to the races expecting a good time but there are occasions we catch greatness. The date of that U2 show was March 5,1981. On March fifth 2011 Aqueduct saw some decent horses including Stay Thirsty, Toby’s Corner,Calibrachoa, Deputy Daney,Vengeful Wildcat, Rift, Sensational Slam, and a number of also rans. If one of these turns out to be the next big horse how many people will say they saw him at a crumbling track with a few grizzled handicappers watching greatness in its’ dawning. For the record my sister’s first concert wound up being Loverboy. And if only because of that I’m sure she still ranks them as one of the greatest bands in rock and roll. Maybe one fan of racing got to see Aqueduct for the first time and fell in love with something we all did years ago. When the future is written we may have seen nothing special amidst the dust and debris over a miserable winter at a miserable track, but for every 1,000 Loverboys there is a U2 in there. We may have seen them and not even known it. August, Belmont’s not winterized; much of the inside isn’t even heated, I don’t think, so being there until the end of November would be just brutal. Don, I read that book last fall, after picking it up at a wonderful, now closed, bookshop in Midway, Kentucky. Liked the book very much; I wish that the columns were dated. For some, one can figure out the approximate date; for others, no idea. Thanks, everyone, for the comments and the memories. Glad to see all the Aqueduct love! Yes, Theresa, TAoC’s omitted publication dates & table of contents is a real negative! I’m certain that the index was conscientiously assembled (the entries are quite specific), but this can only compensate to a limited degree. For instance, the obituary of Marshall Cassidy (born 1892; thank you, Mr. M.C., born in 1945!) – well, it’s just plain nuts not to have provided its publication date. This CSI (“Chronological Sequence Ixnay”) gambit can work – Garson Kanin’s “Remembering Mr. Maugham” (Atheneum; 1966) prospers despite the back-&-forth format of diary entries. But the same decision by some schnook named Joe McCarthy (a long-forgotten editor; not THAT J. Mc.) practically ruined “fred allen’s letters” (Doubleday; 1965). By the way, ask the puddy tats (do they eat tater totters?) how they think Channing Hill will do on Friday (04/29/11), & likewise, David Cohen, on both Friday & Saturday (04/29-30/11). My own quasi-feline instincts tell me that they’ll be visiting the winner’s circle. AQ evokes little nostalgia in our home. Elena & I went there 5-6 years ago; climbed five flights of stairs (reason forgotten); then we were refused lateral entry into the main dining room; retraced our steps & then climbed another five flights. It was our understanding that this “flights” business belonged over there, a few hundred yards away, at Kennedy Airport. The restaurant: There were but two tables occupied. We both finished at about the same moment; time to leave. The waiter gave us the other table’s check & the other table got ours. Isn’t Midway the site of a beautiful college? I think we stopped there a couple of years ago. Their poor main street looked as if the last customer had left town on the day AQ had opened, so it’s not surprising that the book store went away. Beautiful collection of thoughts and memories. Thanks Teresa!! I was there on that last day and took a lot of pictures. And like you said, couldn’t help but think that, whatever opens up in late summer, or more likely when racing returns in November, will be something very different, and that Saturday was the last time we’ll ever see that grand Big A from a bygone era. Does anybody remember the radio commercial from years ago that had the Big A jingle? Thanks everyone!